Vanlife doesn’t only mean living and traveling in a van full-time. Most people actually just use for recreational purposes on the weekends and during their holidays. 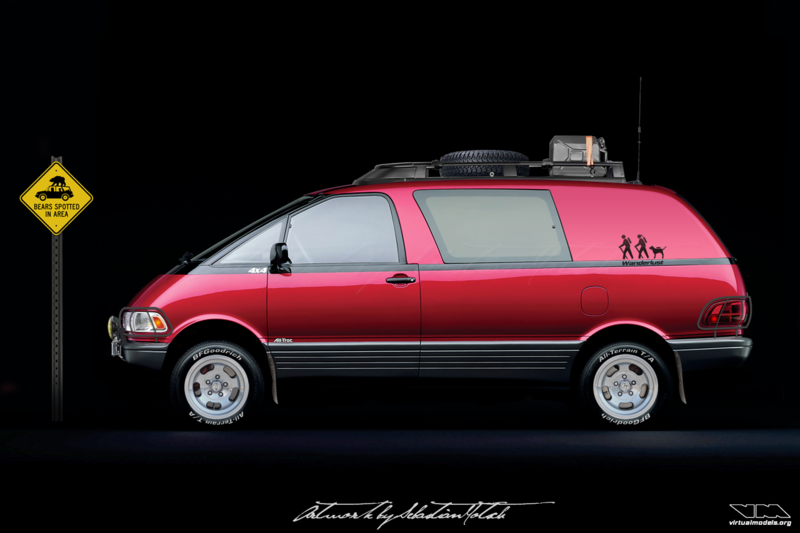 I found a picture of a 1990’s Toyota Previa All-trac and wondered if it would be possible to create a low-budget vehicle that has the ability to take you off-road to those remote hiking trails. After returning from the trail you could cook a meal, have a cold drink and sleep until the next morning. I removed the rear windows to make insulation easier and create room for storage. A body lift helps to tackle dirt tracks with more clearance and the light guards protect all four corners of the Previa. The bumpers have been shortened to improve approach and departure angles. And if you manage to get stuck, the winch will pull you out of trouble. Old school Wolfrace slot mags give it a that 1970’s vanlife touch and the roof rack provides storage for the spare tire and a couple of gas and water canisters. Add a CB-radio for those areas without cellphone reception and you’re set to go exploring. Happy hiking! Awesome, I’m building this out right now…haha. it’ll look different,. It it’s going to be a sweet micro camper out of a 1995 4×4 supercharged Toyota Previa. I’m adding a roof rack that includes a roof top tent and a rear bumper rack that holds fuel and gear. Not sure what to do on the front yet, but also want to lift it 5″ and put 30 or 31’s under it. Here is the build concept – https://youtu.be/–8rCAValTk. I start tearing into it next week! thanks for the kind words. That’s a great project you are planning. Please make sure to send pictures and/or a linf once you are finished.